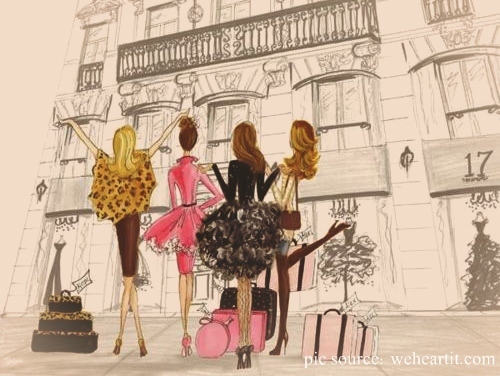 Women and shopping are two things that can not be separated. Of course we already do not know anymore how many times we end up buying something that previously we did not even thought. Something that could have been we do not really need and should not enter our shopping list. Sometimes we can buy something just because a discounts and large-scales promos, sometimes because these items is a trend hype in fashion magazines and local celebrity, our friend buy it or just because we feel that the goods are 'cute' that's why we want buy it. The reason why we buy something often just because 'we want to buy it', we does still love the goods after a week but then we even forget that we have it. Try to remember why we're here, go shopping during this time? If it turns out the reason is: "Ah I always shop something every see the store", "Duh how online shopping bring the happiness" or even, "I think I had a problem on spending" because the credit card bill payment was uncontrolled. Most people shop not based on need, they may feel that shopping is the compensation of all the emotional pressure. Probably due to problems at work, not too good relationship with family or friends and buy something because influenced by friends. If these things is behind our desire for shopping it is very likely we will spending too much on shopping. Too much shopping would not be good on our financial cycle. Shopping can be fun since there are many products that will make our lifestyle choices become easier. But if we do too much shopping, it is not something healthy for our emotional life. There are many activities that we can do to change the activity walking around the store that ended up with buying this and that, and the next minute we realized that there has been excessive shopping. For example, when our pleasure is to accumulate and prepare the clothes we buy, maybe we can play a game that allows us to do the same. If we still have problems with the spending habits at this stage, immediately change our expectations. Research from the University of Duisbur-Essen tells that the joy we get from shopping online does not mean that if we would not buying anything online except we expect online shopping can meet our specific needs or objectives. If you are already applying the things above and still feel the urge to spend, well learn to suppress your desire and remember that if you let the desire that you could be in big trouble.